Make sure all the your items are marked for identification. The usual method is to stick tape on the bottom of the pot or stand, with your initials or last name. Please make sure the “tag” is not visible from the viewing angle. You can use an indelible marker or pencil rather than tape. Please bring as many stands or other items that can probably be used under the plants. We are always short stands, mats, finished wood slabs or cross-sections of trees, etc. Even some wood blocks or “box-shaped” things. One year we used a wire milk delivery basket, draped with burlap, that the Arboretum had laying around, for a base to support a large cascade. We may find a use for these things, as long as they can safely support the displayed item. The usual maintenance always applies to your plants. Clean the pots. Clean the soil surface of debris. Remove any insects, webs and/or disease. Spray them with your favorite fungicide/insecticide. Remove dead or yellowed leaves. Remove moss ( but not lichen ) from the trucks and surface roots. If the tree is wired, make sure the wire is “tidy”, … not loose, or ends sticking out past the branch end. Dust and/or buff the stands. 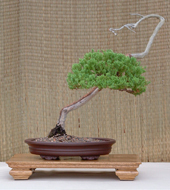 Wooden display stand: The committee is extremely careful not to scratch the stands while placing and removing the pots. If you are concerned with this happening, here’s a trick: go to your local hardware store and purchase some 1/16” or 1/32” Plexiglas sheeting. Cut it so it fit’s just inside the outer dimensions of the stand. Hardware folks may even cut it for you if you give them the measurements. You can also use felt or cork foot pads on the pot legs. These do have a tendency to fall off when they get wet, but are better than nothing. Even a small glob of hotmelt is fine for this. How your items are displayed. Every year your annual show committee has quite a task to fulfill. 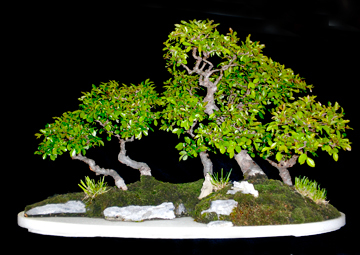 They have to consider how to set up a great looking public display that will not only look nice for first-time viewers of bonsai, but also be as technically appropriate to the knowledgeable viewers. They have to do this with little advanced knowledge of exactly what trees, stands, accent plants, viewing stones, accessories (scrolls, figurines, etc.). Space is limited. They can only fit so many tables in the display area. The arrangement of the tables, especially for the number of trees displayed is also limited. Your show committee does the best it can with what it has. Those who attended last year’s show may have noticed a difference in the way the display area was set up. Because of the excellent support of you, club members, bringing quite a lot of trees and other material to be displayed, we attempted to arrange the tables to allow a maximum number of displays. We believe this worked out very well. We are, of course, always considering improvements. Along those lines, we would like to give you a basic explanation of how the display is arranged. Taking into consideration that the show committee has been given “final say” in what goes where and with what, here’s how we try to accomplish our task. When all the display items and accessories arrive on the Friday before the show, all the trees are placed in one area, and all the other items, including stands, accents, accessories, are placed in another. Since we do not have the luxury of formal tokonomas, or even dividers between display sections, we arrange the display trying to use each six foot table as one separate area. As an example, if there were only two major trees on one six foot table, and several slanting trees to select from, they would be chosen to lean back in toward the center of that table, making one six foot wide display area. The row of tables down the center of the greenhouse was used to display trees and plantings that could be most easily viewed from two sides. These included forests, cascades, etc. We continue to consider ways of using this center row of tables to make it more obvious to the viewer “which side is the front”. You may not find your stand matched up with your tree (or accessory ) when you attend the show. Like some major shows, we mostly do not have the perfect stand to match the perfect tree and pot. During setup, the committee spend hours attempting to match a stand to a tree. This is a very involved process. Consideration is given to plant type, style, color, seasonal attributes or native area or growth (tropical vs. temperate), pot size and shape and color, the height of the planting, and it’s overall size, how to match the choice of stands to not only fit with the tree and pot, but also into the display, and even how it effects the height of each section. Attention is given to accents and accessories in exactly the same way, with the same considerations of how they will fit into the overall display. So when attending the show, please do not be surprised, and please do not be upset with the committee’s arrangement. Again, we are doing our best. If you care to pass along your comments and/or criticisms, the committee will be at the show so you can voice your opinion. Nothing is set up without a reason, and we’d be glad to hear your opinion, and explain the why and wherefore.